tung::blog: I wanna play this chord on that guitar! I wanna play this chord on that guitar! 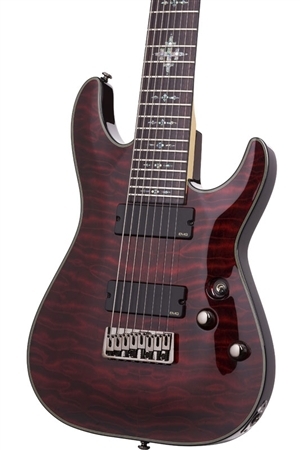 It's a Schecter Damien Elite 8 8-String electric guitar. Yup, 8 strings! Eight-string guitars are growing in popularity, particulary in the Metal community, and are used in bands like Meshuggah and Animals as Leaders. I figured I'd play it like any guitar, but with the benefit of the added lower strings. For one thing, you have more real estate on the fingerboard on which to improvise. Also, you can add another, lower 5th to your standard barre chords (E-shape) on the 7th string. In addition, you can just play chords not possible on a 6-string guitar. Many of them have a longer scale length. The main benefit of this is better sound for the lower strings. It's the reason a grand piano's bass strings sound much better than an upright piano - the grand piano has much longer bass strings than the upright. So I'm pretty happy with this guitar. It's beautiful, well-made, and fun to play, however, the one thing I'm having trouble with is... string spacing. Now I'm talking about the space between the strings. It's narrower than that of a 6-string guitar, and the problem with that is it is more difficult to play chords, and just feels odd, plus it's pretty easy to get your left hand on the wrong string when you're used to a 6-string. On many of the websites where you can order a guitar, they have a list of specifications, but string-spacing is generally not listed! This is a problem I hope is remedied soon. I don't know anywhere where a guitarist can play a number of these things to compare them. These days, you just have to order a guitar, try it out and then decide whether or not to keep it.